Most writers experience a time when they are stuck and can’t get their creative juices flowing. This creative block can be a paralyzing and frightening landscape. If a writer is unable to break through this block, it can derail their career. If you have ever smacked into a creative wall and felt stuck in the writing process, this workshop is for you. This session will help you identify the root causes of your creative blocks. We will focus on the creative process and fool proof block-buster techniques designed to help release your creative muse. Strategies for increasing productivity and organizing your creative life to avoid blocks will be explored. Join Mary Jo Guglielmo as she discusses breaking through writer’s blocks. She is an intuitive life coach that has helped writers move their writing careers forward. See Mary Jo’s post on Tips for Smashing through Writers Block on the Writers on the Move website. 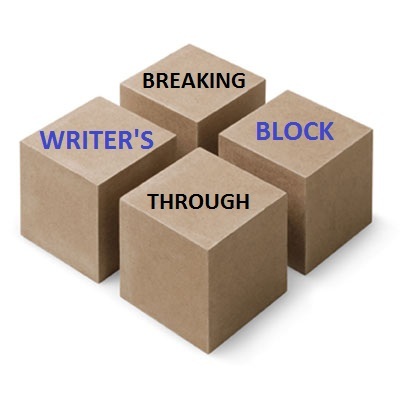 To register for “Breaking through Writer’s Block” email Karen at: karenrcfv AT *yahoo* DOT com. Please put "Writer's Block Webinar" in the subject box. Details to attend the LIVE WEBINAR will be provided upon registration. There will also be a bonus PDF workshop handout included that registered attendees will receive after the webinar. PLEASE SHARE THIS WORKSHOP INFORMATION! I'd love to do this workshop Mary Jo, but once again time is an issue for me here in S.Africa. Are you recording it? All the best! Thanks to Karen it will be recorded! Just register so you can get the recording. Yikes. Derail your career? Sounds serious. Thanks for the info! Writers block comes in many forms. I have known writers on the brink of giving up because they couldn't move past their wall. Yes, we'll be recording the webinar and there will be a workbook, so email Karen at karenrcfv - A T - yahoo to register. Great promo Mary Jo and it looks like it will be an excellent, very valuable session (sometimes block takes insideous forms). I'm afraid we've got a major soccer coordination exercise (3 kids and 2 parents!) happening at the workshop time (it's Sat am for me), so won't be able to participate directly, but I'll register for the handouts, and will definitely help promote. Thanks Maggie. I have two kids (now in college) and weekend activities were pretty crazy, but it was a fun time. I was always glad the kids didn't out number the parents in the house, I'm not sure I would have survived. With your permission I'd like to publish your announcement on my blog. That would be great Donna. Thanks! I'll be signing up for this workshop. Thanks for offering it. I posted the link on Twitter and Facebook. Thanks and glad you can participate.